Mexico’s equivalent of the Domesday Book was compiled in the sixteenth century. Conquerors often have very little idea of precisely what they have acquired until their victory is assured. In many cases, one of their first post-conquest steps, therefore, is to undertake a comprehensive survey of everything of value, or potential value. For instance, in 1086, William the Conqueror ordered a survey of his newly acquired England, the results of which were compiled into the Domesday Book. The decision to send out his assessors to every corner of the land was made at his Christmas Court in 1085. As a belated Christmas present to himself, William wanted to know “what or how much each landholder had, in land or livestock, and how much money it was worth”, so that he could tax it accordingly. Though less comprehensive, a pictorial record of the wealth of Mexico already existed prior to the Spanish conquest. The Mexica people had gradually established an empire (the Aztec Empire) stretching from the Gulf coast to the Pacific. In order to administer the tributes due from each part of the empire, they recorded the requisite payments of feathers, animals, minerals and food, on bark paper codices. Some of these documents still survive, though most were destroyed by the Spanish. 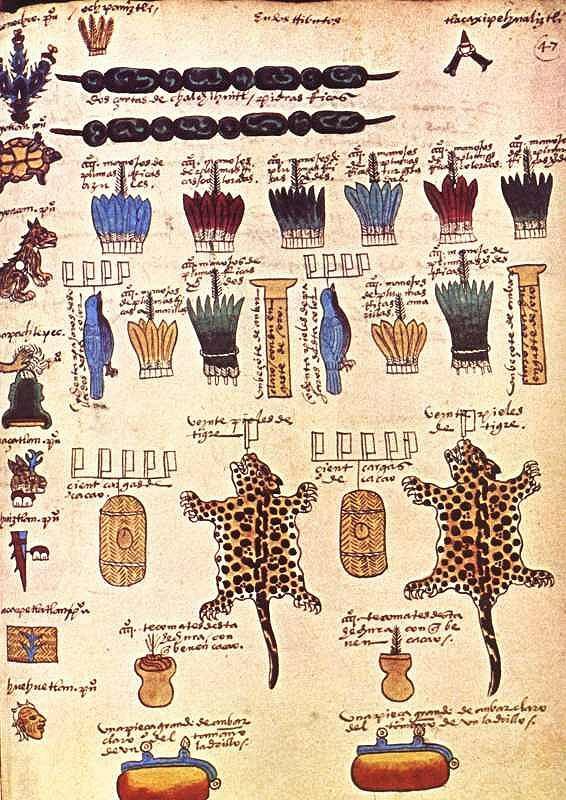 The image below is taken from the Codex Mendoza, which was created shortly after the conquest as a record of Aztec life, including the tributes payable by various villages and towns. Such tribute lists were of little interest to the Spanish when they arrived. Some of the items held in high esteem by the Aztecs were deemed worthless by the conquerors. Other items, such as silver, of little or no consequence to the Aztecs, were highly prized by the Spaniards. Back in Spain, the Spanish Court was determined to acquire accurate information about everything being encountered in New Spain. This led to a series of censuses and accounts, including the Relaciones geográficas (Geographic Accounts), the earliest version of which dates back to the late sixteenth century. In 1569, shortly after Juan de Ovando y Godoy was named Visitor of the Council of the Indies, he sent a questionnaire containing 37 questions to the New World. Another questionnaire, with about 200 questions, was sent in 1570. A few years later, perhaps in an effort to elicit more responses from the provinces, Ovando y Godoy’s former secretary and successor Juan López de Velasco reduced the number of questions to 50. These 50 questions, sent to New Spain in 1577, became the basis for the Geographic Accounts. The authorities in each administrative center were instructed to call a meeting of the “Spaniards and other natives in the district”, to find out everything they could about the area’s geography, people and history. Of the 191 known responses to the 1577 questionnaire, 167 have survived in archives to the present day. Most of the original responses are housed in Spain, in either the Archivo General de las Indias (Seville) or the Real Academia de la Historia (Madrid). A further 43 of them form part of the Benson Latin American Collection in the University of Texas library in Austin. The library’s webpage about the Relaciones geográficas has several links to images of sample pages and maps. A future post will look at the content of a typical example of a “Geographic Account”. Several transcriptions of the Relaciones geográficas have been published in Spanish. The version used in preparing this article is Acuña, R (ed) 1987 Relaciones geográficas del siglo XVI: Michoacán. Edición de René Acuña. Volume 9 of Relaciones geográficas del siglo XVI. Mexico City: Universidad Nacional Autónoma de México.